The grocery home delivery market is ultra competitive. The big grocery players like Giant, Shop Rite and Wegmans all offer home delivery via manned delivery vehicles. Kroger appears to be first in the autonomous grocery delivery service race. 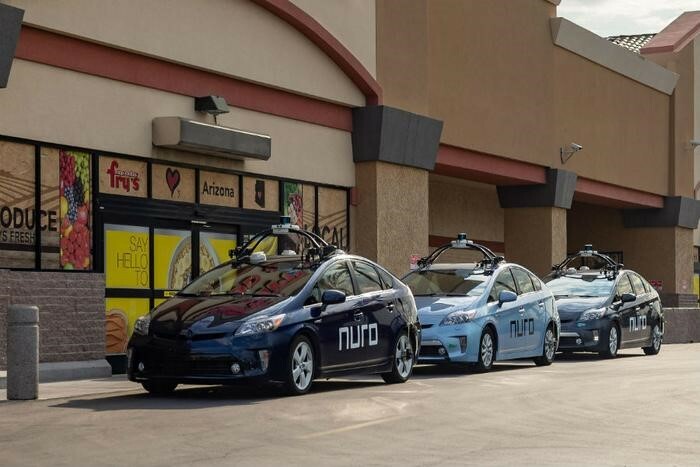 After successful testing last year in Scottsdale Arizona, Kroger, the nation’s largest grocer, has launched a self-driving grocery delivery service in Houston, the latest salvo in a massive grocery market that has supermarket chains investing heavily in new technology to win over online shoppers. Company officials this week showcased the first of dozens of autonomous delivery vehicles planned for Houston: Toyota Priuses outfitted with cameras, sensors and self-driving computer software. In today's competitive grocery market, companies are turning to autonomous vehicles, automation, robotics and artificial intelligence to stand out. Kroger is competing with Amazon, Walmart and other businesses to capture consumers who want fast deliveries without hassles. Though field testing for automated vehicles has been relatively successful some hurdles to full implementation remain. Namely, consumer acceptance and comfort in riding in these vehicles. Also, alarming is the idea of an 80,000 lb commercial tractor-trailer rolling down the interstate on autopilot. Additional concerns include who will be servicing these vehicles and the threat of domestic terrorism by system hacking. While a number of struggles remain, some conditions have softened in Q4 2018, giving logistics buyers more room to breathe. After a 2018 that saw record setting levels of freight hauling demand and driver pay as tonnage levels reached a 20 year high, the trucking industry is expected to remain strong in 2019 but undergo a bit of a cool down, economists say. Revenue growth remains healthy for all major U.S. transportation sectors, though recent events could level off the rate of growth for some segments in the coming months according to Fitch Ratings in its U.S. Transportation Trends spring report. For the economy and the trucking industry, 2018 was spectacular. The U.S. Gross Domestic Product expanded at a 3.5% rate in the third quarter, and the December jobs report from the Bureau of Labor Statistics showed the economy added a robust 312,000 positions. From expedited transportation services to shipping technology integration, 2019 is shaping up to be a year in which shippers evolve to meet the growing demands of both B2B and B2C sales. 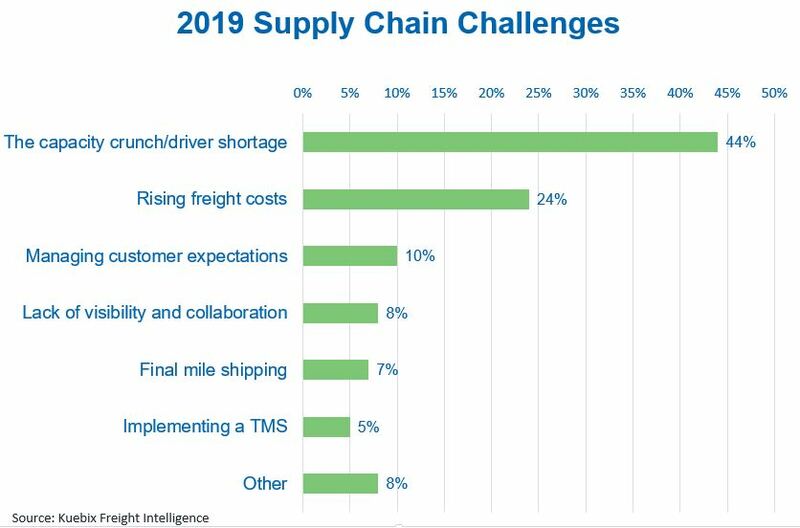 To help transportation managers cope with the changing appetites of a growing demographic we'll take a look at some developing supply chain trends in 2019. Warehouses and distribution centers around the world are coping with massive change and investment to stay competitive. Challenged by the demands of e-commerce and omni-channel fulfillment, smaller orders, ever-shrinking delivery timeframes, and a persistent labor shortage, operations are in perpetual need of tools that can help them tackle these and other ongoing productivity issues. Technology is the driving force in the warehouse and DC transformation. 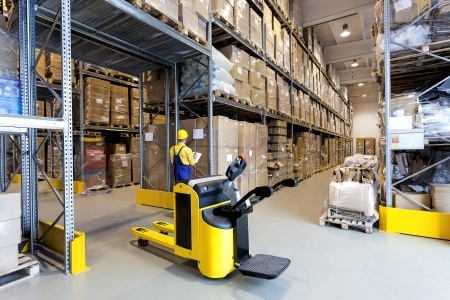 With automation, robotics, artificial intelligence and other advanced technologies making their way into the world’s distribution facilities, the warehouse management system has become a vital component to manage the increased amount of information. And because it collects valuable information along the way, WMS also provides actionable data analytics that companies can use for good decision-making. 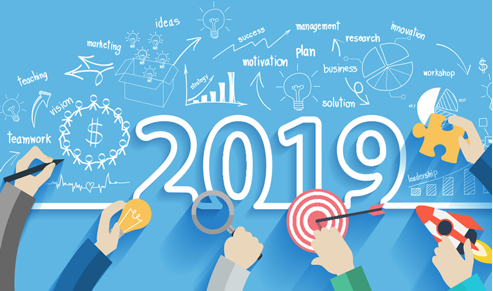 Let's take a look at some industry trends for 2019. In an effort to convince warehouse and DC managers to take the next leap in automation implementation, equipment suppliers are coming up with creative finance plans to make it easier to upgrade. One approach that more companies are adopting is that assets can be rented versus purchased or leased. In other instances, the WMS vendors which sell the systems that run the automated equipment are now working more closely with their end users to help make it more affordable for a wider swath of customers. Perhaps the biggest turn off to any computer program is a complicated user interface. Logistics managers don’t have the time to sift through reams of data to find what they’re looking for. Pertinent data needs to be a mouse click away. WMS vendors are focusing on their user interfaces and coming up with ways to present data in a more logical format to users. The focus is on making systems more engaging and easier to use, and particularly in a same-day-shipping environment, where a field service technician or retail clerk can use the system with little or no training. In the online ordering world returns are a major line item in the profit and loss statement. Managing those returns more accurately will mitigate the return allowance figure in the financial statements. Returns management systems have made a sizable impact on the distribution environment, and are pushing technology vendors to add better precision management capabilities into their systems. Companies have to be able to manage precision, while more economically managing individual items. While WMS systems certainly help companies pick, pack, and stage, they are also inventory systems. As items get returned, shippers need to be able to return those goods to either inventory, vendor, wholesale or scrap to accurately determine their value. These are just a few trends to watch for in 2019. Form more information on how technology can benefit your organization contact us today. The right pricing strategy is a critical component that companies can’t afford to overlook and is one of the most important aspects of maintaining profitability. In the manufacturer-distributor-customer value chain, one of the manufacturers most pressing challenges is being able to mark up prices in a way that helps maintain profitability while not pricing that customer out of the market. This balance is getting harder to achieve in the current B2B business environment, where the next competitor, price comparison or huge online retailer is literally one mouse click or screen tap away. Focused on serving their customers while maintaining healthy profit margins, manufacturers have to effectively balance the cost of manufacturing with the company's profit goals. Goals that are hard to attain if the company isn’t using solid pricing strategies. As data continues to proliferate right along with the number of technology tools to help harness that data, companies are learning how to leverage that information across multiple departments for maximum success. Accurate data can more precisely reflect the cost of manufacturing by considering critical issues such as seasonal raw materials fluctuations, capital equipment depreciation and labor concerns. Manufacturers should be generating these cost equations on a monthly basis to forecast cost fluctuations and react in plenty of time to adjust pricing. Even those manufacturers that think they have the pricing game under control will surely face a new competitor, get hit with a new market trend or face another economic challenge in the near future. Look what Uber did to the taxi business. Manufacturers of the future will also understand that effectively engaging customers requires true innovation in executing the value chain. Traditional approaches to inventory, logistics, pricing and rebates will be reimagined through the application of advanced analytics and technology innovations. 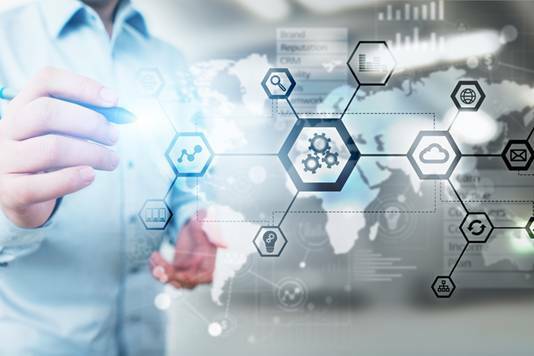 Given the importance of data, analytics and technology to both engaging customers and executing the value chain manufacturers will also need to leverage IT to truly energize, not just enable, their business. Data management is central to keeping track of your costs throughout the manufacturing process. If data is properly recorded and accessible to every link in the chain, managers can touch base with their product at every stage, helping maximize efficiency, address problems quickly, and improve customer satisfaction. Additive manufacturing is a process of making three dimensional solid objects from a digital file. Unlike printing a flat picture for example on a piece of paper, a 3D printer actually builds something in 3 dimensions. So to call it printing is a bit misleading. The device builds upward and outward with each progressive layer of material. The creation of a 3D printed object is achieved using additive processes. In an additive process, an object is created by laying down successive layers of material until the object is created in three dimensions. Each of these layers can be seen as a thinly sliced horizontal cross-section of the eventual object. 3D printing enables you to produce complex, functional, shapes using less material than traditional manufacturing methods. The number of production-ready additive manufacturing platforms that ship each year will increase more than 10 times by 2030, as the technology’s use in structural and mission-critical commercial applications comes to fruition. According to a new report published by ABI Research, a market-foresight advisory firm, these systems will produce more than $360 billion worth of parts and end products each year and nearly $2 trillion in sum by the end of the next decade. There is so much fascinating technology around us today. Everyone wants to believe the next one will be a game changer. The major interest in this particular technology is the potential of additive manufacturing to do much of a company's own manufacturing rather than engaging in trade to buy products from other sources. 3D printers capable of creating just about anything in color and multiple materials already exist and will continue to improve to a point where functional products will be able to be created. 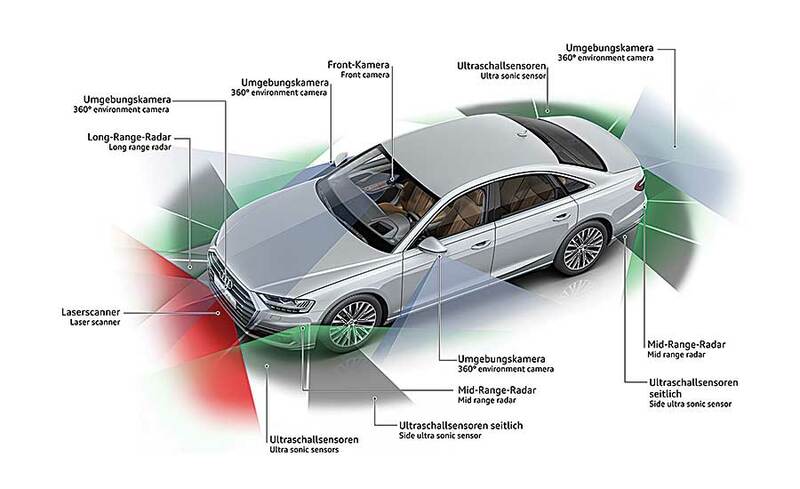 The automotive industry represents the largest opportunity globally with $148 billion in additive manufacturing product value forecast for 2030, but it is closely followed by the machinery markets, and these figures differ from country to country. The United States currently leads the world in terms of AM product value but will be passed by China in 2029 under present conditions. Additive manufacturing brings production closer to the places where products are sold and used. For suppliers, this means the ability to better dictate the priority, timeliness, and process that best fits their manufacturing needs. 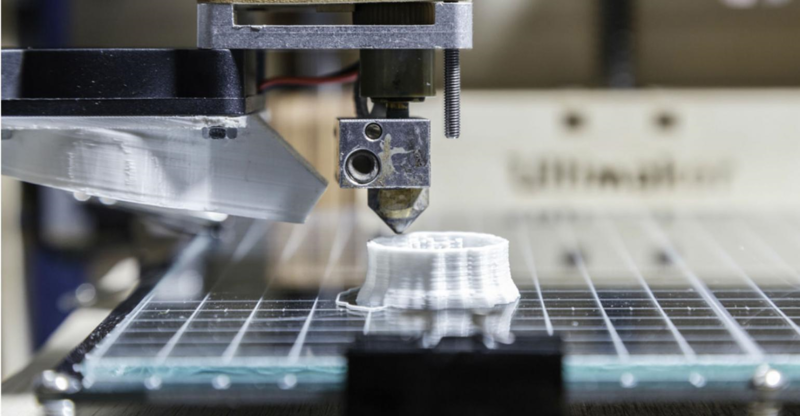 3D printing has the potential to change the manufacturing world as we know it. This technology has the potential of transforming our global supply chain in a very profound way. How profoundly, at this point, is very unclear. Any supply chain begins with a manufacturing point. Then warehousing, inventory management and, of course, transportation arrangements. Now AM technology allows us to reduce manufacturing lead times, as well as transportation costs, and also reduce the carbon footprint associated with production and distribution. AM shouldn’t be thought of purely for manufacturing since it could have much broader supply chain implications. The original applications were originally used for printing small numbers of simple objects made of one or two materials but that's rapidly changing. Its most promising initial contribution may come in a couple of basic areas. Though mass customization, creating products that fit perfectly with the desires of one customer, is a very hot topic and trend, all of these elements represent a cost and quite an effort. This means you need to make sure it is right for your application and industry, and that the added value for your customer matches your effort. Manufacturing lead times and transportation cost savings can be erased quickly with inaccurate customer data requirements. Simple examples of this mass customization may be common consumer products like earphone buds, cell phone cases or sunglasses. Another significant advantage to 3-D printing is the replacement or spare parts industry. When the Maytag man, or whomever, shows up to repair your home appliance there is no need for inventory in his truck. Just a 3-D printer and some software. The same argument can be made for just about any similar service type industry. AM technology still has some obstacles to deal with. There are implications for the digital supply chain to go along with the physical one since the intellectual property resides in the file from which the object is printed rather than the product itself. Therefore security will be an issue in handling and shipping these types of assets. This means that in the future, we’ll need to really examine this data chain to ensure that the information it contains is securely transported and managed. This is where technology like blockchain would likely be useful. This is a great growth opportunity for the global logistics supply chain industry. This is also where the digital supply chain technology comes in. To stay current on these technologies and more, subscribe to our blog www.Land-Link.com. 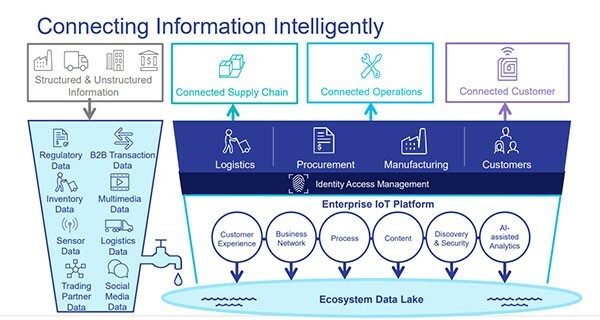 Digital technologies like the Internet of Things (IoT) are driving transformation across the entire manufacturing process by disrupting all aspects of production, from research and development to engineering and design, factory operations, and sales and support. Ultimately these technologies will increase efficiency in the manufacturing process, reduce costs and reduce the product time to market. A new generation of shopping options through e-Commerce and m-Commerce (mobile commerce) has made supply chain management a vital area of concern for many businesses. It is particularly critical for manufacturing companies, which are heavily dependent on the supply chain partners to deliver their products. With an increasing emphasis on technological advancements, as well as the changes in customer expectations, the need for integrated supply management has become increasingly important. In the retail environment particularly, where the margins are thin, technology is the key component between profit and loss. And in this market, the sharks are circling. This July, a Walmart supply chain first is coming to Colton, California. A newly built, 340,000-square-foot high-tech consolidation center will be the first in Walmart’s supply chain to receive, sort and ship freight. This automated technology will enable three times more volume to flow throughout the center and helps Walmart deliver the right product to the right store, so customers can find the products they need. Back in 2005, Amazon launched its Amazon Prime service. Customers, paying an annual membership fee, received guaranteed two-day shipping on hundreds of thousands of products. In fact, the introduction of two-day delivery was the game changer and established the dominance of Amazon in the online retail industry. When many other retailers started to catch up with that strategy by offering their own free two-day shipping, Amazon tipped the playing surface by offering a one-hour delivery with its Amazon Prime Now service. The fight now seems who can deliver product faster. The rub, however, is it has to be done at a profit. A massive Walmart-owned center, which will open in July with 150 full-time associates, can move three times as many cases. It will grow to employ more than 600 associates by 2021. With the combined might of people and world-class logistic technology, this facility will be the most efficient consolidation center in Walmart’s supply chain. 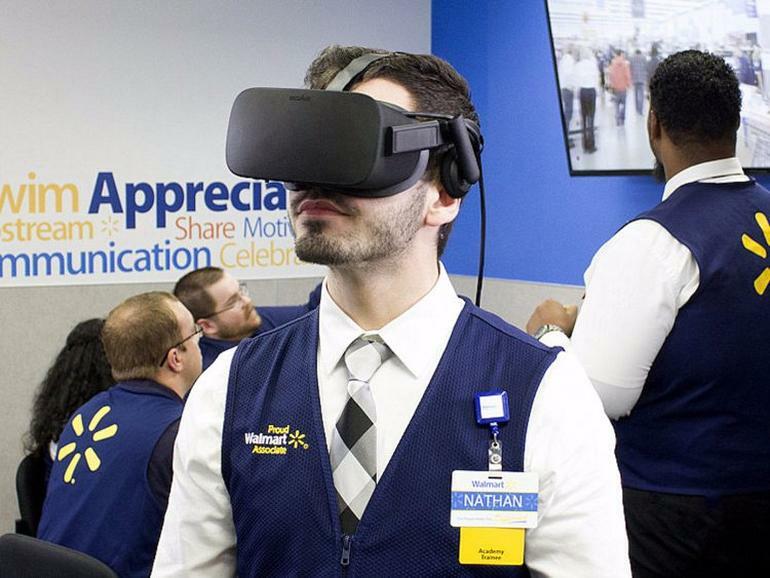 Walmart continues to expand its portfolio of high-tech distribution centers. In October, Walmart announced that it had broken ground on a tech-enabled perishable grocery distribution center in Shafter, California. I have to recuse myself of my opinion to some degree since Philadelphia was in the running for an Amazon Distribution Center Headquarters. Sadly, we didn't make the cut. There is one thing I have to admire about Amazon. Management may have adopted the Bill Bellecheck game plan of logistics protocol. They seem to have designed the playbook of online retail from order to fulfillment to the final mile. When Amazon made its official selection for the locations of its second headquarters, it was hardly a surprise to anyone following the lengthy HQ2 saga. But tucked into the announcement were tidbits we didn’t know, including information on what it took for the two sites to win out over the dozens of other bids. Target is lagging a distant third in the giant race for a retail giant of the world. The only strategy for small to mid-size retailers to break into this market is to be lean. Operational efficiencies will be crucial for anyone to be competitive. To keep up with your competition subscribe to our blog, or better yet, join the Land-Link.com client family and let us show you what a lean supply chain looks like.